Not much more to this story than the title: “Tiger Woods’ Dubai golf course development officially halted“. If this is real this is awesome! Check out: “Black Widow attempted New Year Moscow attack but blew herself up by mistake“. Liz in the news! Check out today’s Portland Press Herald article about her not job fair but “networking night”: “Immigrants network at international job fair“. 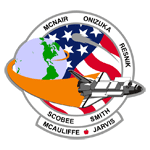 Today’s the 25th anniversary of STS-51-L, the Space Shuttle Challenger disaster. Orange You Glad It’s Not Red? The US Department of Homeland Security is changing the “Homeland Security Advisory System” a/k/a the Terror Alert: “Homeland Security to replace color-coded terror alerts“. 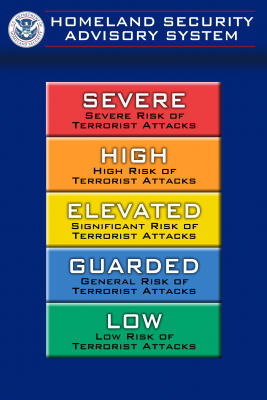 Currently the Threat Level is “Yellow”, except for on planes, where it’s “Orange”. As in, “High Risk of Terrorist Attacks”. It has been since 2006. That informs me that I shouldn’t travel. Shoot, I wouldn’t want to travel were the level “Yellow” – “Significant Risk of Terrorist Attacks”. One of my favorite things about Disney is the attraction posters from the theme parks. 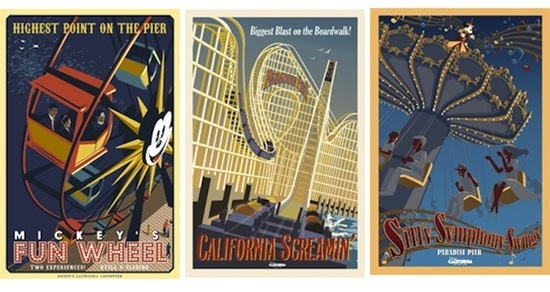 Check out: “New Attraction Posters Paint a Fresh Vision of Paradise Pier“. I just read a blog post about the possibility of selling naming rights to infrastructure that was cute enough, but then they made a good jab at the KFC Yum! Center and I had to share it. You might remember I poked fun of that name back in November (see KFC Yum! Center). Wow, so I don’t feel like going to Taco Bell any time soon. Have you seen the new lawsuit that contends their “beef” is actually “taco meat filling” and that their ground beef “seasonings” are really “extenders”? “In reality, a substantial majority of the filling is comprised of substances other than beef,” the lawsuit alleges. And those seasonings? 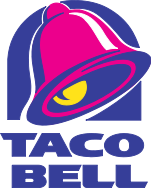 For future reference, “taco meat filling”, according to the USDA, must contain at least 40 percent fresh meat. Nope, I don’t feel like going to Taco Bell any time soon. 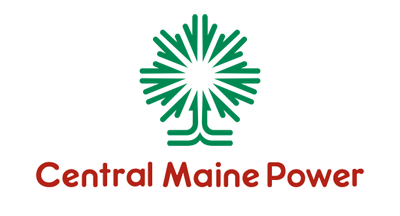 I opened up my Central Maine Power bill last night (and yes, the bill is higher with these new smart meters) and found an ugly new logo inside. Not that the old logo was stellar, but it was classic in a kind of Paul Rand way. “Paul Rand-lite”, perhaps. 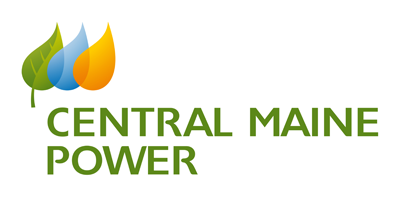 Apparently the new logo is an alignment with the logo of parent company Iberdrola USA. In fact, I didn’t even realize that Energy East had been renamed “Iberdrola USA”, and that apparently happened in December of 2009. Then again, I haven’t paid too much attention to my energy company, I suppose. All-in-all it’s too bad that yet another distinct logo is going by the wayside for something that’s got ugly gradients and no silhouetting. And is that a drop of sunshine? Really?! Remember The World islands in Dubai? We actually talked about them three years ago today (see The World). 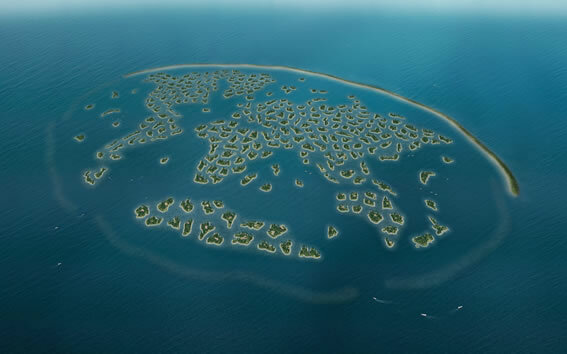 Of course, this all comes from a lawsuit against Nakheel, the state-run developer on the islands, but still, it’s quite possible. Maine’s Tea Partier-in-Chief, Paul LePage, has been in the news quite a bit lately; most recently he told off the NAACP the week before Martin Luther King Jr Day, calling them a “special interest”. Sometimes I think his “special interest” is upsetting people with whom he doesn’t agree. Granted sometimes I think he talks first and thinks later. Wow, this combines two of my favorite stories of the last few weeks – one can now pay at Starbucks using one’s iPhone! I have to point out that there’s actually no waving involved, however; there isn’t RFID in the iPhone. It’s simply an iPhone application that displays a barcode specific to one’s Starbucks gift card that the clerk barista then scans. But I can see where “wave” sounds more futuristic. I’ve been dreaming of maglev transit since I was in 8th grade (where I won the Science Fair, you may note). 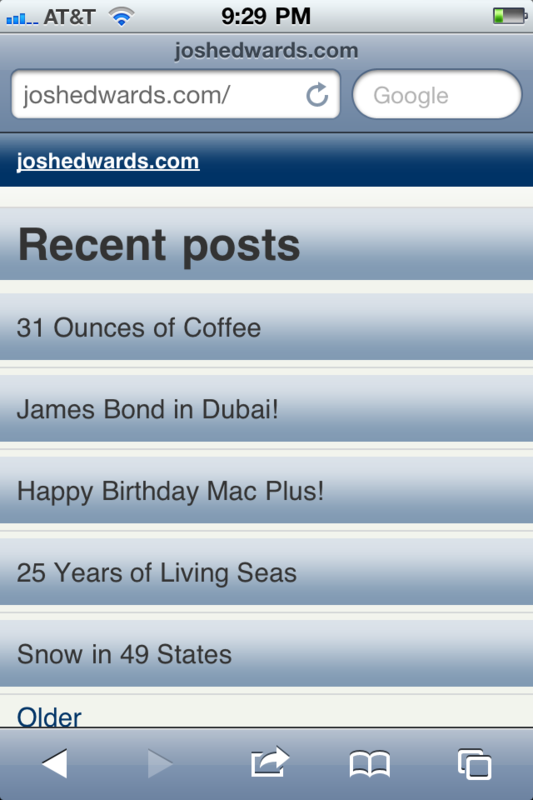 Those of you at home probably (hopefully) won’t notice anything different, but the blog here is now optimized for smart phones, like my new iPhone. 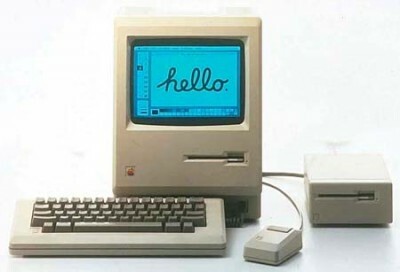 Let me know if you see any problems with the site (either real computer or phoney) over the next few days. Thanks! I meant to mention the new Starbucks Coffee logo the other week but was swept up in other nonsense. Well Starbucks is in the news today, again for something rather silly. Today they’ve announced a new 31-ounce sized iced tea and coffee drink – the “Trenta”. 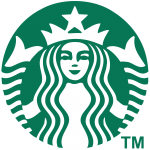 Check out: “Starbucks Expanding Rollout Of 31-Ounce Drink Size“. Canada’s National Post points out that’s larger than an average human stomach. No, not the next movie (the currently titled “Bond 23” coming out November 9, 2012) but the next novel, coming out May 26, 2011. 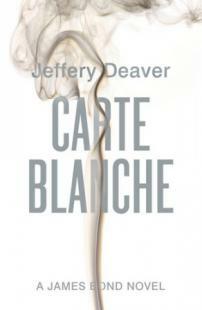 Just today publisher Simon & Schuster announced that Jeffery Deaver’s contemporary-set James Bond novel will be titled “CARTE BLANCHE” and is set in Dubai! 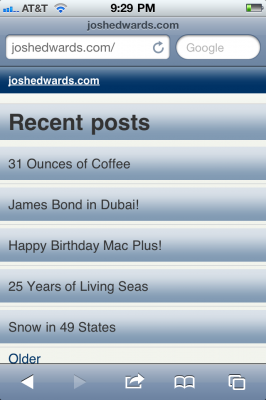 Throws another monkeywrench into my whole James Bond vs. Mission: Impossible in Dubai debate (see James Bond in Dubai). Today marks the 25th anniversary of Epcot’s The Seas with Nemo & Friends Pavilion (formerly “The Living Seas”). 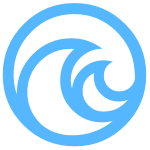 You might remember that John Ritter hosted the television special that introduced us to Seabase Alpha, Seacabs and Hydrolators. With the arrival of snow in New York and the unusually severe storm in the South – which dumped more than a foot of snow in some areas – the National Weather Service said an unusual nationwide occurrence had taken place. There was now snow on the ground in every single one of the 50 states – including Hawaii, which had snowfall on one of its volcanoes – except for Florida.